Living with a serious illness often changes the way individuals experience their world. “Every human being has a belief system that they utilize, and it is through this mechanism that we individually, ‘make sense’ of the world around us” (Uso-Domenech & Nescolarde-Selva, 2016). Faith and spirituality can emerge as important elements of a person’s care plan. This is the fifth course in a nine-part series, Primary Palliative Care Skills for Physicians, NPs and PAs. Take each course individually or enroll in the full series for a significant discount! Learn more about the full series here! This course helps clinicians develop an approach to identify, evaluate, and address spiritual, religious, and existential concerns, and presents assessment tools, strategies for coping, and referral guidelines to intertwine quality healthcare with spiritual care. 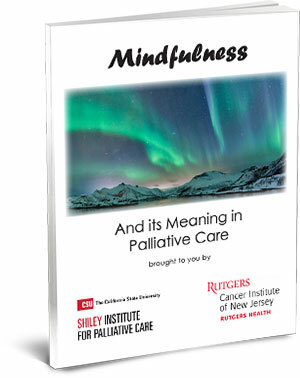 In palliative care, mindfulness is a therapeutic tool that can offer patients profound relief from anxiety and the discomforting symptoms of their disease. The Doctors Company designates this activity for a maximum of 1.5 AMA PRA Category 2 Credit(s)™. Physicians should claim only the credit commensurate with the extent of their participation in the activity.